The Componi 200 Uno wall lamp from the Italian manufacturer Cini & Nils scores with their seemingly limitless diversity. You can put them together according to your personal ideas and put in your rooms so with this very individual light a highlight. 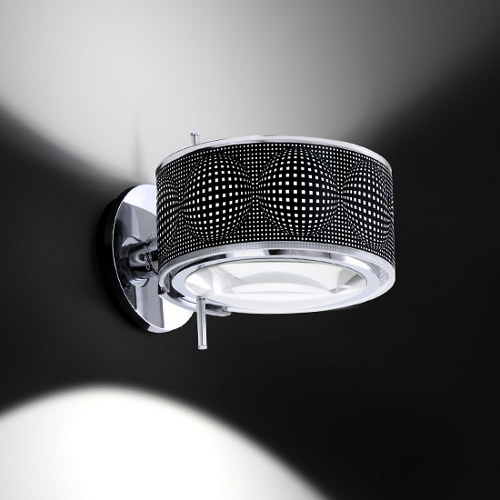 Above and below has the Componi 200 Uno wall lamp via a respective filter disc and / or a lens that ensures the right light effect. You can choose from different designs. The filter discs are clear, satin, rasterized scanned opal-white, red dichroic, dichroic dichroic yellow or blue. For a very special lighting effect, a lens can be installed, which is available in two versions: with 70 ° or 105 ° angle. The outer ring of the glass Componi 200 Uno wall lamp by Cini & Nils is available in several versions: sfero-black, white, red, yellow or blue.